This year during the prestigious Madras Music Academy dance festival, a foreigner was among the distinguished dancers to perform during the festival. This was Dominique Delorme from France. He was actually supposed to perform during the previous year’s festival but had to back out because of a serious injury. 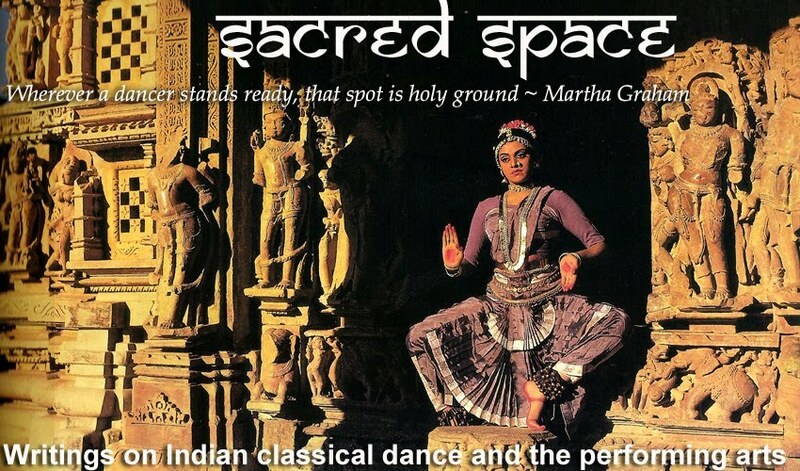 There are very few non-Indians who are invited to perform at this important dance festival. Others I can think of are Ramli Ibrahim and his troupe of Malaysian dancers, and Mavin Khoo, also from Malaysia but based in London, UK. When I put the question to the director of programming, he confirmed that only three non-Indians have performed at the dance festival. “But there will be more,” he added. 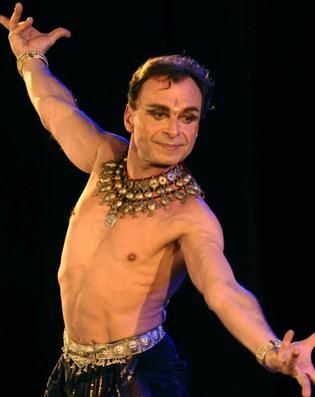 Dominique Delorme is probably the best known French dancer of Bharata Natyam. He first came to India to study dance 25 years ago. 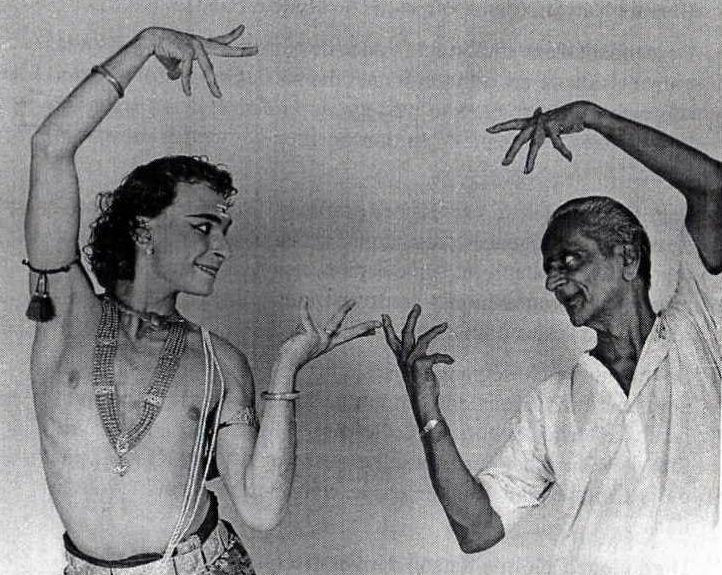 He had created a stir in the Madras dance scene when he presented his arangetram in 1990 and though he had to leave India soon after, many remember him for his excellent technique and perfect angasuddhi. Having been absent for 10 years but still very much in the memory of many dance aficionados, his performance on the concluding day of the festival was much anticipated. Not less because he would be performing the choreographies of VS Muthuswamy Pillai, a rare treat. I was interested in hearing about his experiences learning with his late guru and had the opportunity to interview him. I found him affable and easy-going. During our discussion, I noted his obvious passion for India and dance, and absolute sincerity and dedication to learning every aspect of it. He lives and teaches in France and has choreographed many productions and performed in Europe, North America, the Middle East, and Asia. You studied dance on a full-time basis in Chennai during the mid to late eighties. When were you last in India? I haven’t been back to India for ten years. To come back after 10 years is very moving. The most moving thing was to meet my gurus again. To meet those who are still with us and to go to my guru Muthuswamy Pillai’s room. To step into that room was something extremely moving. His son is teaching in the same room in Mylapore near the Kapaleeswara temple. Some things have changed: they have put in floor tiles and the walls have been repainted. And my guru had sat on the other side of the room where his son sits teaching now. I had no news of my vocal music teacher. So on my second day here I went to visit her. But I met only her husband. He told me she passed away two years ago. I didn’t know. That was a shock. Last year I had an accident while dancing just three weeks before I planned to come to India, so I had to cancel my trip. I had been invited to perform at the Music Academy dance festival. So it was postponed to this year. I would love to come to India more often but it’s difficult for me to come more often for financial reasons. Also for the past seven years I was busy building a house. It took me a lot of time and money. Now it’s complete. I built it with my own hands, from the foundation to the roof. I’m happy I did it. But maybe I shouldn’t have done it because I injured my arm in the process! But I would love to come to India more often… not only for the pleasure of performing but also the pleasure of seeing other artists and seeing how they have evolved with time. There’s also a special atmosphere here during the music and dance season. 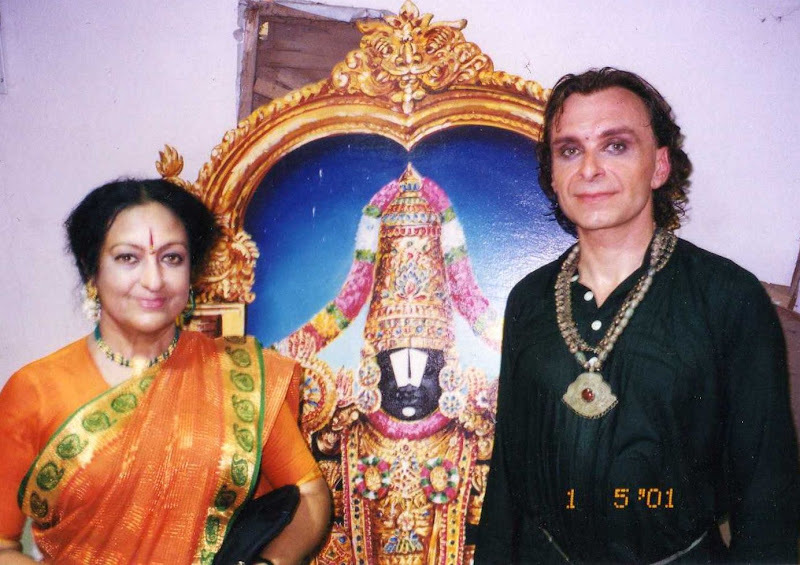 There was a wave of dancers from France who came to study dance in Chennai in the eighties. Many of them started learning in Paris with Christine Klein, whose stage name is Malavika. Why was Indian dance so popular in France at the time? I think Malavika was really the pioneer of Indian dance in France. Her first guru was Kanchipuram Ellappa. And when her guru passed away she went and learnt from Muthuswamy Pillai in Madras. She had also learnt a few items from Padma Subrahmanyam. I started learning from Malavika in Paris in 1985. I had one year of training with her before I got a scholarship from the French and Indian governments to study dance in India. When I got the scholarship, Malavika told me about a master in Chennai. She said: “His name is Muthuswamy Pillai. I think he would be extremely happy to have a male student. He’s been waiting for a male student for years and years. Of course there are many masters, but I think it would make him happy and it would make you very happy.” So I went to study with Muthuswamy Pillai. He had a lot of French students because many had initially learned from Malavika in Paris. Only some of them are still dancing now. Most of them have left dance. Perhaps Indian dance was popular because we had the Festival of India in France in 1985, just when I started learning dance. I think that was an opportunity for many dancers in France to see Indian classical dance and they were inspired to learn it. I had never seen Indian dance before joining an Indian dance class in Paris. And the second reason was Malavika. She was teaching workshops in Paris as well as many other places in France. The third reason is that Malavika developed a scholarship and cultural exchange programme through the French ministry of foreign affairs. It was a joint effort between the ICCR and the foreign ministry who both contributed financially to a scholarship programme. So we had the opportunity to study in India for years and learn from great masters. But two years ago, this scholarship scheme was unfortunately stopped and we don’t have such a system anymore. I was part of the selection committee. There would be auditions where students would dance an item and we’d interact with them and then we would give marks and according to the marks, they would get the scholarship or not. The decision to stop the scholarship scheme came from the Indian government, not France. If it had been because of France I would have fought like anything to make sure it stays. But unfortunately the decision came from the ICCR itself. It’s very sad. Because I know what it’s like to stay here for years. You cannot make a dancer in 6 months, in one year, in two years, in three years or in four years. You need a lot of time for the Indian classical arts. Look at classical western ballet. It also needs a long period of training. So now there are no more auditions and no more scholarships for French students. I got the scholarship from the French government and the ICCR initially for three years and then the ICCR extended my scholarship for a fourth year. Then for my fifth year I was on my own. My guru had passed away by then. I started teaching his students, Indian and French. I was his last disciple. Just before he passed away, I had promised that I would stay here and continue his style. It was a promise. I didn’t want to go back to France. The French government had sent someone to fetch me! They told me: “You promised, you had signed the paper saying you would go back. Your time is up, you have to go back to France and you have to teach what you learned here." So I had to go back. Then I got the Villa Medicis prize. It was a fellowship. I also got the Romain Rolland scholarship. So that helped me come back to India to do research on the karanas and the Natya Shastra with Padma Subrahmanyam. I had already started learning with her in 1989 before Muthuswamy Pillai passed away. I went to learn with Muthuswamy Pillai in Madras after only one year of training in Paris, and like many dancers, I thought I knew a lot. But when I came to Muthuswamy Pillai, I found out that I knew absolutely nothing. So the training began with adavus in a very vigorous way. It was hard work. He was a very demanding master and he met my expectations. I learned only adavus for at least one and a half years. And he taught me something like 500 adavus when most masters teach between sixty and eighty. He had developed a lot of different varieties in each family of adavus. And I didn’t mind at all to work only on adavus because it was a new discovery every day. Even he was discovering and composing new adavus every day. So it was a lot of joy even though it was hard work and after some time he started composing items for me, starting with the pushpanjali and mallari, and then jatiswaram and varnams and padams. He never choreographed the same item in the same way. He was always choreographing according to the capacities of each student. So not one of us had the same choreography. He had had most of his training from Meenakshisundaram Pillai but he had also learnt from Muthukumar Pillai. But Muthuswamy Pillai had evolved from what he learned from his masters. He had really come up with his own style. During the last 5 years of his life, he composed a lot of new things, both adavus and choreographies. My choreographies were full of mandi adavus. Maybe because I was a boy and he thought a boy could manage it! I think he got his inspiration from his students. That’s why he didn’t always teach or choreograph in the same way for each student. His son Selvam has a different style because he didn’t learn from his father. He learned from his father-in-law who was there in the village - Kuttalam. We used go to his village often. We would take the night train and reach there in the early morning. We would stay there for two or three weeks. We would have class there every day and we had a wonderful time. He spoke very little English. Only a few words, maybe five or six words. So he had a way of looking at you. He would look at your arm, or your araimandi in a way that revealed that it was not up to his expectations. So the language was dance, it was not a spoken language. It was as simple as that. I was holding his hand when he died here in a hospital in Madras. It was on the 18th of January 1992. He had died of cancer. So from 1987 to 1992 I was with him as his disciple. And until the last second, as he was lying in his bed, he was still composing… until his last breath. When he passed away, I left the hospital and took my moped – I had a TVS 50 – and didn’t realise that he had passed away. It was only a few days later that I realised that I had lost my master. It was a big shock… a very big shock. Soon after Bharat Kalachar gave me the opportunity to do an offering to him. So I composed a pushpanjali for that occasion and other students, mostly French students, participated in that offering. What was the dance scene like back then? With regard to dance, a lot has changed. When you look at the choreographies of gurus like Kittappa Pillai and Muthuswamy Pillai and others from those days, you didn’t see so many movements and so much speed. What for? The dance is not there. It’s not in the speed or how many movements you’re doing. But if you’re able to express something in one movement, even if it’s a slow movement, if the involvement is there, then there’s dance. But when there’s too much speed and too many movements there’s no time for the dancer to get involved. There are too many things to do. We observe it in modern life, in India and in western countries. Life is going faster and faster, people have no time to live and they’re not happy. But when you see a person going to a temple just to bring a flower and with so much humility and not in a rush… you see that they’re in peace with themselves. That makes a big difference. But too much agitation can only lead to an unpeaceful life. Are students today ready to make a commitment in terms of time and dedication? Or do they just want to collect items and are not concerned about technique? Today many foreign students, as well as Indian dance students, want to learn items immediately. I have a good friend who teaches dance in California. She told me that she has parents coming to her – most of her students are of Indian origin – with their kids who are 7 or 8 years old and they tell her: “My child will learn with you and in 6 months will present her arangetram.” Imagine! When I went to learn with Muthuswamy Pillai, I had studied dance for one year with Malavika in Paris, but that was nothing. If I had one hour of adavu class, I would practice for two hours at home. Because whatever he taught me I wanted to make sure that the next day I would have it perfect. The expectation was there. We were exposed to great masters and dancers and to reach that point we realised that it needed a lot of work. So I don’t think any dancer, foreign or Indian, can learn in a few months. It’s a long process. Even now after 25 years of learning, I need to learn more and more. Items, items... They all want to learn items. I face the same problem with my students. I have some dedicated students. Some got scholarships to study in India. But money is an issue. It’s difficult to stay here without working and to survive without a scholarship. My scholarship was sufficient. I was living in a simple way which suited me. We got 700 rupees a month at the time. It’s good that there was also some support from the French government too. Do you teach your students Muthuswamy Pillai’s style, or Padma Subrahmanyam’s Bharata Nrityam style? My guru is no more. People tell me that I’m the only one who’s still maintaining his style and they want to invite me for workshops. In France I teach Bharata Natyam and Bharata Nrityam. But most of my students want to learn Bharata Nrityam. After I had researched the karanas, they saw me dancing in that style and wanted to learn it. When you learn Padma Subrahmanyam’s style, you go back to the sources of Indian dance and theatre, so you go back to the Natya Shastra where the basics are very different. You go through a process which involves the whole body, the angas and ubhangas, minor and major limbs. Then there are the charis: how to move in space, which involves movements of the lower part of the body. They you go on to training the upper part of the body which are the nritta hastas and then the combination of the charis, nritta hastas and sthanas, which are the static postures. When you combine these three aspects, you have a karana. So some of my students have learnt up to the 70th of the 108 karanas. They’ve come that far. My students only want to learn Padma Subrahmanyam’s style. They seem to like it more. It’s something new for them. They have already seen Bharata Natyam. When I performed the karana style, they saw something new and they wanted to learn it. I think they see a lot more variety in the karana movements. And it links to the western classical style where you can lift the leg, you can do the rond de jambe and the grand battement. All these movements from western classical ballet have been in the Natya Shastra for thousands of years. So they can relate to that. During my training with Padma Subrahmanyam, I had to start from the beginning. I do the same thing when I’m teaching. If I have someone who has studied Bharata Natyam or Kuchipudi or Odissi for 10 years, I bring them back to the basics, because they’re very different. And you know, not many dancers have the humility to learn from the beginning. What was your best performance experience? One of my best experiences was performing my own production, Nandanar. When I came back to India with the Villa Medicis fellowship in 2000/2001, I was studying with Padma Subrahmanyam. I danced Nandanar at a seminar organised by Kalanidhi Narayanan and also at the Alliance Française. Padma Subrahmanyam was not in town when I performed it. When she came back she said to me: “Oh Dominique, tomorrow’s my birthday. Would you give me a treat? I heard a lot about your Nandanar. Can you please come tomorrow morning at 8 o’clock and perform for me?” So the next day I came and danced it, and at the end she said: “Dominque, it’s beautiful. See you tomorrow.” The next morning I came for my class and she told me: “I have organised performances for you in the temples of Nagapatnam and some other big temples. There you will have a good audience for Nandanar because you will have village people in the audience, common people and farmers who go to the temple, like it used to be long ago. They know the story of Nandanar. They know that he was an untouchable and that he became a saint.” And that was an amazing experience to dance in those temples. One of the greatest experiences I ever had. I have also danced in some churches in France and that was also a nice experience because there are some positive vibrations there. And also the response of the audience is important. Performing is not only that, it’s also an interaction with the audience. How can you feel your audience? It’s in the vibration. You feel it. You don’t even need applause. Sometimes until the last second of the performance there’s a silence… And even when it lasts a few seconds after that, you feel it. You feel how the space has been filled with something which is in the air. And nobody wants to clap because it’s still up there, in the air, and clapping would bring it down. When did you have your arangetram? I had my arangetram with Muthuswamy Pillai on 11 April 1990. It was at the Bharatiya Vidya Bhavan in Mylapore in the evening and in the morning we had had only one rehearsal. In those days we never had more than one or two rehearsals. And today it’s the same because it’s so difficult to get musicians! During the morning rehearsal, in the middle of the varnam, I fainted. That was the only time I saw my guru stand up! He was shaking me, yelling: “Dominique, Dominique! What happened? Dominique!” I opened my eyes and I knew I had to finish the rehearsal. I went outside and bought a packet of glucose, poured the full packet in a glass of water, drank it, finished the rehearsal and went home. The performance was at 6 or 6:30 that evening. I was so weak. The mallari started. I was ready to go on stage and he was there. I took the first step, “Taa…” and I didn’t know how I was going to take the second step. I looked at him and he said go on… and then I didn’t think at all and just did what I had learnt. It was not a matter of mind anymore. It was a matter of soul. It was my guru and I. I was connected to his talams. I don’t think I even heard the mridangam, the flute or violin or whatever. I only heard his talams. Because for years I had only heard him beating the tattukazhi. And I was connected to him. I got through the performance. After the performance people came and complimented me. The whole of Madras was there because I had gone all over the city on my moped delivering invitations to all the gurus personally. The next morning, I went to class and my guru said to me: “Yesterday so many people, very good speaking, very nice Dominique, very nice, very nice. This side coming [he points to his head], immediately outside going. Inside going, not outside coming, big head coming.” That was a lesson! Don’t get a big ego because of praise. You have done your arangetram, you are a beginner, you are just starting. My gurus were not only teaching dance, they were also spiritual gurus, all of them: Padma Subrahmanyam, Kalanidhi Narayanan, Kamala Rani. I always felt that I was their son and that they were my parents. I always felt that they were also teaching me in a spiritual way. That’s one of the most precious teachings you can have. Another thing, Dakshinamurthy is a teacher: Shiva as a teacher. He teaches in silence. He doesn’t speak. You had asked me how I had learned from my guru if he didn’t speak English and I didn’t understand Tamil. In this silence we also learn, and from the silence we learn. On which occasion did you perform the 108 karanas? This was just before I had to leave for France in 2001. Padma Subrahmanyam had taught me the 108 karanas and she wanted me to perform them in Chennai. So she organised a performance at Bharat Kalachar. I was leaving on the 2nd of May and she organised it for me on the 1st of May, the day before I was leaving. It was 42 degrees, the height of summer, and the performance was in an open-air auditorium. And that day I really thought I was going to die. And she saw that. She realised it because she was in the audience and she saw. Because no one had performed the 108 karanas before! At a certain point during the performance, I heard a voice from the wings calling: “Dominique, come!” So during a karana I walked out to the wings, and she put a towel on my face and poured a bottle of glucose water in my mouth and said, "Go! ", and I finished the karanas. I danced them continuously. It takes 45 minutes but it’s like doing 3 varnams in one go because you have no sahitya, it’s only nritta. And afterwards her brother told her, “Padma you should never do something like that. We don’t know what it’s like to perform all the karanas!” So they told me that if I ever do it in France, I should split it in two or three parts, and not do it in one go. Plus it was 42 degrees! It was mad. Gurus sometimes put you in situations where they try to see what your limits are. I remember another time Padma Subrahmanyam was performing in Mamallapuram in front of Arjuna’s Penance and she told me to come and perform two items. We were in the green room, the musicians were there and we were waiting to start. So she went to the stage, and then came back and asked me: “Dominique, you know how to do nattuvangam?” And I said, “Um, yes.” She gave me the talams and told me to go and sit with the musicians. So I went, thinking that I had no idea what she was going to perform. So I thought: there’s only one thing to do; follow the feet. So they put you in these situations, to test your abilities. She’s a genius. She’s reconstructed movements from frozen things, books, sculptures. And I’m very lucky I learnt from her. When I first came to Madras I saw a performance by her at the Music Academy and during the first moments I was disappointed because it wasn’t anything I had seen before. I was expecting Bharata Natyam. But after five minutes and until the end of the performance I was riveted and couldn’t take my eyes off the performance. That day something happened. While she was filming her documentary series on the karanas for Doordarshan we had visited the temples in South India where the sculptures have been recorded in stone. It was also a great experience to see an artist like Padma Subrahmanyam in front of the camera doing certain things. For example, I’ll always remember when she did the vyabhichari sanchari bhavas – which are the physical reactions to the emotions. Like perspiration, getting a red face because of anger, getting goosebumps, etc. One after the other, just like that. It was amazing. And these physical reactions only happen when there’s a deep, very deep physical involvement of the artist. As a young dancer, it was just amazing. I thought, yes this is what I want to do. This is what I want to reach. This level of involvement. I always wanted to learn from great masters. Only when you learn from great masters can you really grow. They become what you want to reach. Their values stay with us and we have to maintain this and continue to the next generation. That is our role now. wow! thanks for this article isabel! Hai Dominique uncle how are you? i am Ramprasath S/O SAMBANDAM in kuttalam. are u remaning me.